Come relax in the Eastern Sierra by the quaint village of June Lake. June lake has been a favorite fishing town since the 1930's. Here you can breath in crisp mountain air, listen to the trees whisper, all while surrounded by a gorgeous alpine setting. Some call June Lake the 'Switzerland of California" for its green landscapes and snowy peaks. Conveniently located on the edge of the Village of June Lake, this house makes relaxing easy in all seasons. Enjoy nature, lake views, and a BBQ with family and friends on the huge deck. In the village so you can walk to restaurants and shops with ease. Fishing and lake fun are also close with June Lake, Gull Lake, and a short drive to Silver lake. June Lake and surrounding areas has more hiking, biking, and climbing than one could explore in their lifetime. Also centrally located to all your Eastern Sierra Adventures including: Yosemite National Park, Bodie Sate park, Devil's Postpile National Monument, mysterious Mono Lake, and many natural hot springs! When the snow falls, come to June Lake for skiing and snowboarding at June Mountain, only a two minute drive from this house. There is also easy access to cross country skiing, snowshoeing and back country skiing or boarding. Come enjoy the Sierras and stay in a lovely house while doing it. Enter this spacious cabin on the second floor to an open living room, dinning room, and kitchen. The kitchen is fully equipped and dining room table sits 7. In the living room there is a wood burning fireplace, 47"flat screen Smart TV, DVD and Blue-ray players, and an iPhone/ipod doc. From the living room you look out into large pines and views of Gull Lake. The deck has a gas BBQ and patio furniture, except in winter. Also on this floor is two bedrooms and a bathroom. Both rooms have king beds and face the forest. Upstairs is a loft with a couch, DVD, VHS player, and 22" TV. There is also another bathroom and a separate room with two sets of bunk beds. Come see why this cabin is quickly becoming the most popular rental in June Lake. The property was beautiful and it accommodated all our needs. From reservation to check in to check out - all top notch. Kudos to your team ! I think that the best experience you can have in working with any organization is on a personal level. This is our families third year staying with this team, and we now feel that we are going to visit our friends instead of just going on vacation. Sierra does an outstanding job! She makes us feel like we are at our home away from home. Thanks Sierra! They were really helpful and amiable. Thank you for everything, I really enjoyed my stay. Hope to visit you again next year. The home was very comfortable, clean and inviting. We wish we could have stayed longer! Nice cabin, but cooling was inadequate during those hot days, especially in upstairs loft. Overall, it was a great stay with our family. MANAGERS RESPONSE: Nobody in June Lake has air conditioning and this cabin doesn't as well. It does get hot a few times during summer and it was definitely hot when you were here. Fans are the best we can do! The team was very knowledgable about the area and really friendly! The property is nestled in the tree line and is quiet and has beautiful views. It was well maintained and was well stocked. 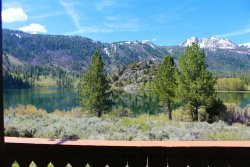 The property is beautiful, you can see Gull Lake and June Lake from the balcony along with beautiful sunsets every night. The cabin is comfortable, we want to stay in the same cabin next year. We loved your home. So well equipped, better than expected! We would love to come back every year! The views!! We all enjoyed our stay. I would like to bring my own family up for vacation. Hope to see you soon. In particular, the check in was a great experience. Friendly, comfortable, and knowledgeable. Great team and great service. We hope to be back next year !! The property was great and better than the Photos! Very enjoyable vacation and home. An Excellent Property All The Way Around!